Are the bed bugs biting? Call Extermination Falcon today, we are the leading bed bugs detection and bed bug extermination company in Montreal. Having bug problems? If you find yourself waking up with red welts all over your body every morning, you might. Bed bugs are becoming more and more prevalent across Canada and are causing a huge amount of discomfort for those who have infestations. Trusting a bug exterminator is the best option to get rid of your problem. Bed bugs are often difficult to see and are rarely found on mattresses and bedding, which is where most people are looking. They are small, flat bugs that will appear reddish brown after feeding. Most will describe them as looking much like an apple seed. They can be found along the wooden frame of the bed as well as along the carpet seam around the wall of the room they are in. The reason that bed bugs are such pests is that they feed on blood. This means that they have to bite the host in order to get a meal. As with most pests, bed bugs are most active at night and will be looking for a meal just as you lay down for a good night’s sleep. 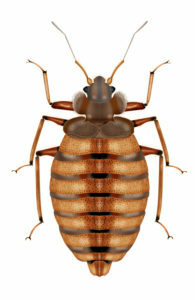 Bed bugs can survive up to a year under optimal conditions. They are also very eager to travel. As a matter of fact, most people become infested in their homes after a stay in a hotel where the pests are picked up in luggage or other personal belongings and are brought home. Typically these bugs are active before dawn. Their feeding period is usually roughly an hour before sunrise. They can however feed at all times of the day if they have the opportunity to do so. Bed bugs can reach their host several ways in order to feed; They sometimes crawl or climb walls to reach the ceiling and will then jump down on feeling a heat wave. They are attracted by warmth and the presence of carbon dioxide. The way a bed bug eats is by piercing a person’s skin (the host) with two hollow tubes, one tube injects saliva (which contains anticoagulants and anesthetics) while the other withdraws the blood. Altogether, a bed bug or a bed bug infestation is not an ideal situation to have in any home. If you are wondering how to get rid of bed bugs, the following will help you to become an expert. If the infestation is bad enough, you might see the pests in action. If you are looking for them, make it a point to look down into cracks and crevasses and start your search at dusk. It’s more likely that you will see evidence when you see the shed skin casings of juveniles. In some cases, you will notice their excrement, which will look like black staining on porous surfaces that can be mistaken for mold or mildew. Most people will discover they have an infestation when the bites begin. Bites will usually be red, very itchy and can cause welts in many people. The bites can be mistaken for mosquito bites or flea bites, but often sting when scratched, which is unique. They can also have a large, red, irritated border that spreads a good distance from the site of the bite. How serious is an infestation? One female can lay up to 500 eggs in her lifetime. And, while the bites are a nuisance, the good news is that bed bugs aren’t known to carry any diseases that are transmissible to humans. At Exterminator Falcon, a bed bug detection begins by identifying a bed bug infestation in your home and then eradicate it. While we can’t prevent a new infestation from happening thanks to the trailing nature of this pest, we can provide you with the information you need to minimize the chances of a new infestation starting. If you suspect that you have a bed bug infestation, don’t hesitate to call and schedule your free, no-obligation inspection and quote for services by a bug exterminator.